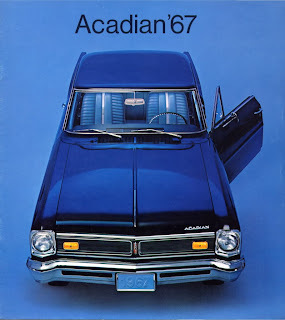 Acadian was a Canada-sourced GM brand that graced our lives from 1962 to 1971. Acadians were assembled in Chile, as well. A 1968 Acadian two-door sedan is seen here. The nation’s Pontiac-Buick dealers were not at all happy when the Chev-Olds dealer body was given the Corvair for the 1960 model year. Compacts were hot but Pontiac-Buick dealers had no small car to sparkle on its showroom floors. It was true enough that they carried GM’s pint-sized British Vauxhall line as a captive import but there was still a very visible price and size gap in the models offered. shell but dealers shunned it and the prototype was stillborn. American Pontiac dealers had the Tempest but it was not a viable option here. There wasn’t a big enough market to justify building it domestically and under existing laws, it was too expensive to import. For the time being, dealers would do without. It was galling to watch potential customers leave the dealership and head down the street for a Corvair or worse, a Volkswagen Beetle, a Rambler, an Austin or a Studebaker Lark. The situation needed to be addressed. 1960 Chevrolet Corvair was built in GM Canada's Oshawa, Ontario plant. Despite Volkswagen's success, GM's rear-engined Corvair did not set the world on fire and management quickly hustled a more conventional compact to market. Chev-Olds dealers would have the pert Chevy II and this time around Pontiac-Buick dealers would be included. Oshawa would once again reach into its time honoured bag of tricks to create two brands from one body shell. With a little styling magic an all-new, badge-engineered brand bowed at Pontiac-Buick dealers for 1962. Christened Acadian, the proud name was carefully chosen to reflect our national heritage and pay homage to the rugged roots put down by those first European settlers. The harsh, rocky, wooded, spruce lined Atlantic coast was claimed for France as Acadia and tamed in the 16th Century by rugged settlers who spread out across Acadia--the land that is known today as Nova Scotia, New Brunswick, Prince Edward Island, the Gaspé Peninsula, the Magdeline Islands and Maine. By choosing Acadian, GM paid homage to the effervescent courage of those hardy individuals who persevered in nation building in the face of harsh climate, hardship and war. 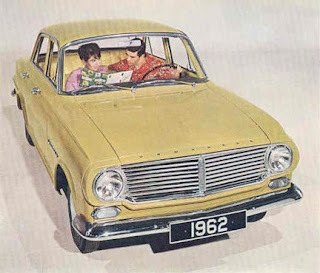 Canadians could also purchase the thrifty Vauxhall Victor, sourced from GM's British subsidiary. Selling for the modest price of $2,,383 F.O.B. Oshawa, when fitted with a thrifty four-banger. Acadian was an instant hit with consumers. It scored 14,654 registrations in its first year, racking up a full 3.5 percent of all new car purchases throughout the Dominion. It placed in the Lucky 13 spot, ahead of GM's Oldsmobile and slightly behind British stable mate Vauxhall. Execs in Oshawa were ecstatic to finally steal sales from the competition, especially from Falcon and Rambler. From St. John’s to Victoria, Pontiac-Buick dealers were delighted to finally be cut in on the action, too. Canadian production of the Acadian ended in 1967--Centennial Year. The little car quickly became entrenched in the hearts and driveways of consumers. 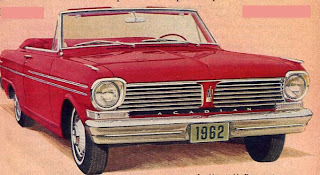 With the advent of AutoPact in 1965, a Canada-only compact was no longer needed but Acadian had a strong and loyal following. 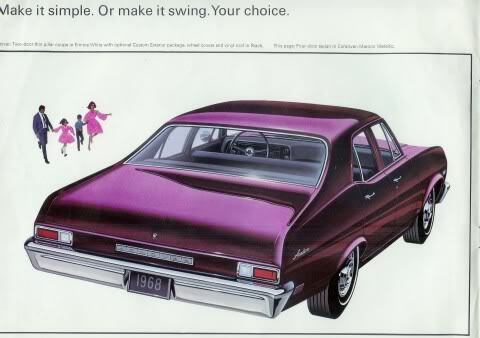 Who knew if consumers would buy an unkown vehicle like a Pontiac Tempest? Only time would tell. 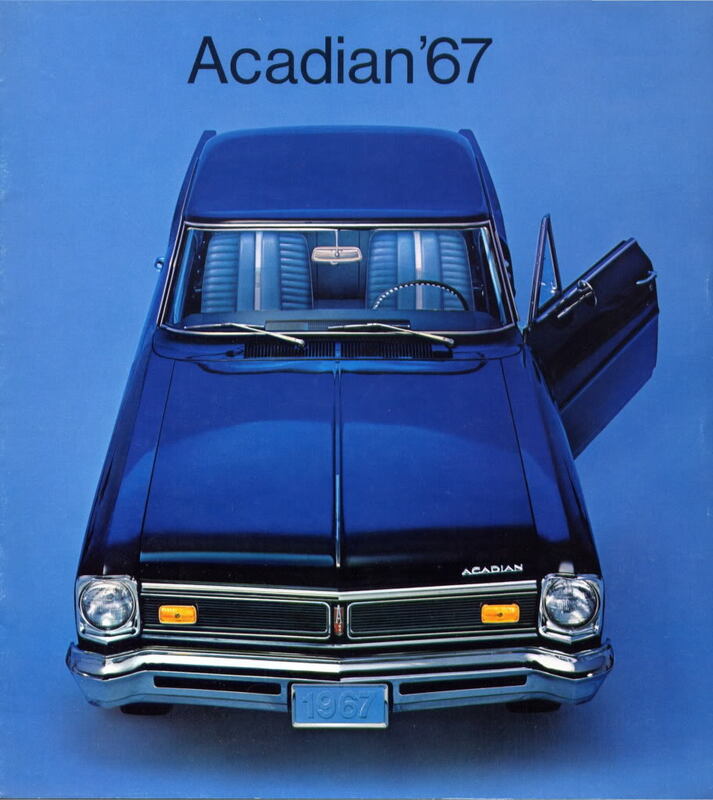 The last of the homegrown Acadians rolled out the plant doors in June of 1967 as GM Canada rationalized its product line in a new continental grid. The 1968 Acadian was built exclusively in Willow Run, Michigan. It shared the Chevrolet Nova shell but got its own badging. The Acadian nameplate would not be retired. Acadian would continue to be built for Canadians only--but ironically enough--imported now from Chevrolet’s Willow Run, Michigan plant. Rolling off the line with Corvairs and Novas, the Acadians were loaded up for their ride home to Canada. Once prepped and gleaming on the showroom floor, its price tag was just $25 more than a Nova, starting at a very modest $2,731. Acadian paid attention to safety items required by the Ministry of Transport. An energy-absorbing steering column, seat belts fore and aft, shoulder belts up front, the four-way warning flasher, a dual master cylinder brake system, dual speed windshield wipers and washers, an outside rearview mirror, a glare-resistant padded instrument panel and sun visors were all standard equipment. New this year were the illuminated side markers. The four-cylinder mill was dropped but a generous Metric half dozen power plants were still available: the Econoflame 230-cubic inch six, rated at 140 horsepower; the 250 with a 155-horsepower rating; the 307 with 200 horses; the Super Econoflame 327 with 275 horsepower and the Astro Econoflame with 295 horses. The latter two required premium fuel; the latter three could be mated to optional, floor-mounted, four-speed manual transmissions if desired. Even the low bucks stripper Acadian came with three interior style choices. 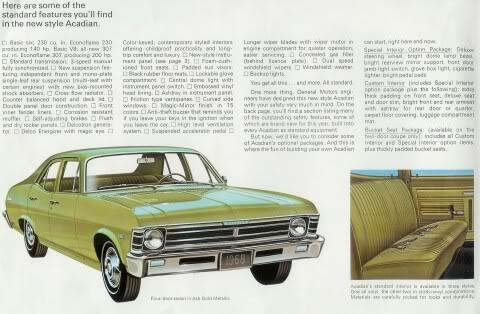 One was encouraged to shell out a few bucks and “build” an Acadian to order with a Custom Interior that replaced rubber matting with carpet, a luxurious Bucket Seat Package, a centre console with a T-bar gear selector (the latter was available only for Acadians equipped with the optional Powerglide transmission), red line tires, an AM push button radio, an eight-track player, power steering, power disc brakes, vinyl roof, a rear window defogger, heater, block heater, bumper guards, a performance instrument cluster, heavy duty suspension front and rear, two-tone colours, Shade-Lite glass, a remote control outside mirror and an electric clock. For an extra $240, the SS option bestowed upon the humble Acadian GM’s wickedly fast 350-cubic inch Astro Econoflame V-8 mill with “many chromed components” and dual exhausts. The Acadian carried special hood ornamentation, under hood insulation, wore Super Sport script on the front fenders, was given a deluxe steering wheel with the SS emblem replacing Acadian’s two traditional maple leaves, sported a blacked out rear end panel with special mouldings, got the heavy duty suspension, finned front brake drums, unique SS wheel covers and a set of Wide Oval E70-14-4 red line tires. With 295 horsepower pulling a paltry 3,117 pound load, an SS Acadian could rip the centre stripe right off the Number One Highway effortlessly. SS owners didn’t give a flying fox that the 15-Imperial gallon gas tank would require filling at nearly every Pacific 66, B/A and Golden Eagle station their pocket rocket Acadian passed. Showing off at the gas pump was half the fun of owning one! 1968 turned out to be a good year for Acadian with 5,353 units delivered. 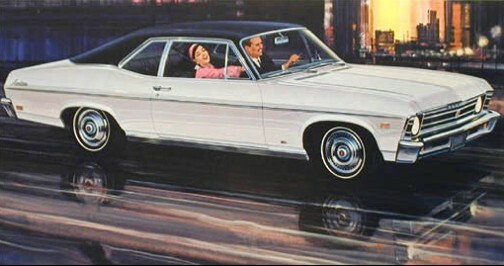 The marque would soldier on until 1971 when it was replaced with Pontiac’s Ventura II.